What mechanics won’t tell you is that it’s easy. 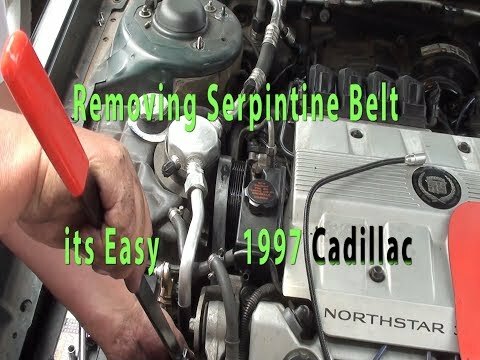 it’s not that hard to remove a Serpentine belt from a 93,94,95,96,97,98,1999 Cadillac DeVille Northstar engine. See what tool I used. Watch this video a few times to develop your confidence. If this video was helpful or even saved you time or lots of money please pay it forward by supporting this channel so we can continue producing how-to videos to benefit others. Through your support, you bring value to you and other people’s lives. Thanks for your generous support. Imma just call you Caddy Man!!! Good info!!! I have a 97 Deville and I absolutely love it. Just used the video for a 99 Eldorado. Thanks, Brother! @0:39 for safety purposes, when disconnecting a car battery, always just disconnect the ground cable. NEVER put a metal tool to the positive, as that act alone, you can accidentally touch the metal wrench to a metal part of the car, and get an extreme spark! !